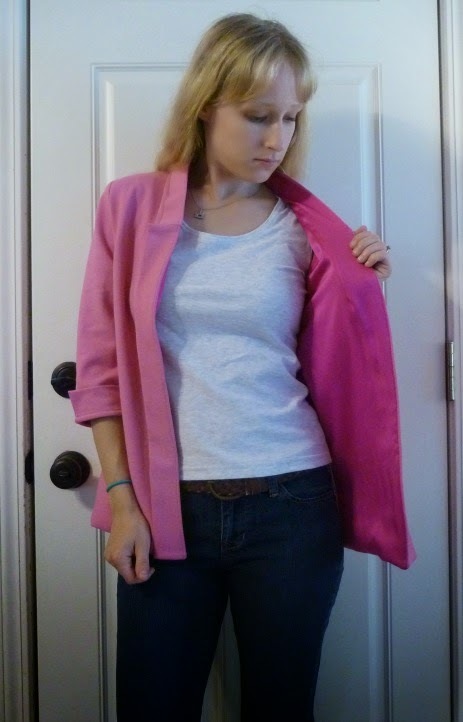 Even though the Victoria Blazer pattern is a simplified blazer, without too many challenges, I found as I was sewing that there were a few tricks to making the project go more smoothly. If you're about to embark on this pattern, I hope some of my advice will be helpful! You can read my original review here. As a reminder, my Victoria is made with a cotton ponte for the shell, and a stretch silk charmeuse for the lining (both fabrics from Mood). The pattern is intended for wovens, but a stable knit like ponte will work. I made a size 2/4, which is the smallest in the envelope. 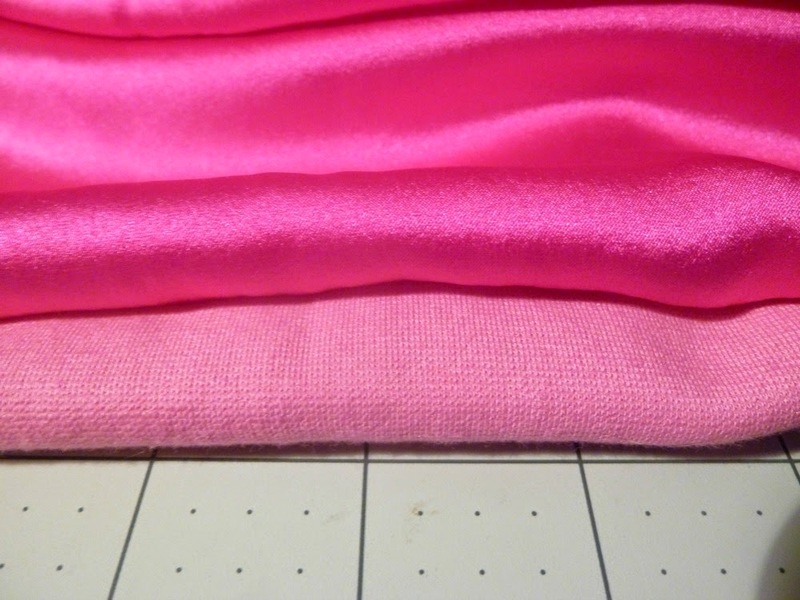 There is a GENEROUS amount of ease, so please check the finished garment dimensions before choosing your size. The sleeves are fairly fitted but the bodice is meant to be oversized. There are no closures so the blazer will be open when worn. I used a totally different order than what is detailed in the instructions (which, by the way, are VERY good). 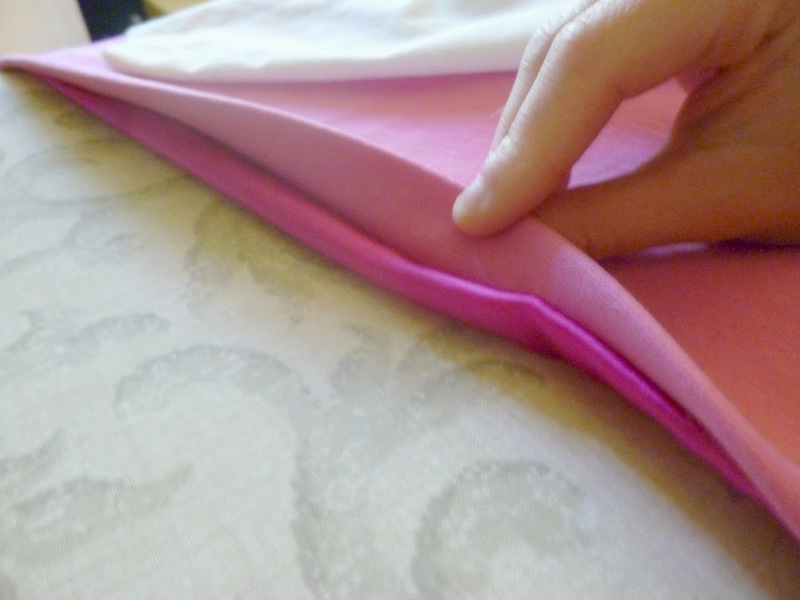 I wanted to sew as much as possible with the ponte before sewing the silk. The first reason was laziness, I didn't want to switch my needle back and forth a bunch of times. The second reason was practice. The shell and lining are constructed the same way, so I wanted to work out any kinks with the ponte and be that much more prepared for the silk. The third reason was efficiency. I think the directions make sense the way they are written, but they aren't that fast. For example, there are many rectangles on this design (the sleeve cuffs, the collar, the lapels) which are all sewn the same way. It's much faster to make them all at once, then go over to your iron and press. Just make sure to mark your pieces so you don't lose track of which rectangles are which! 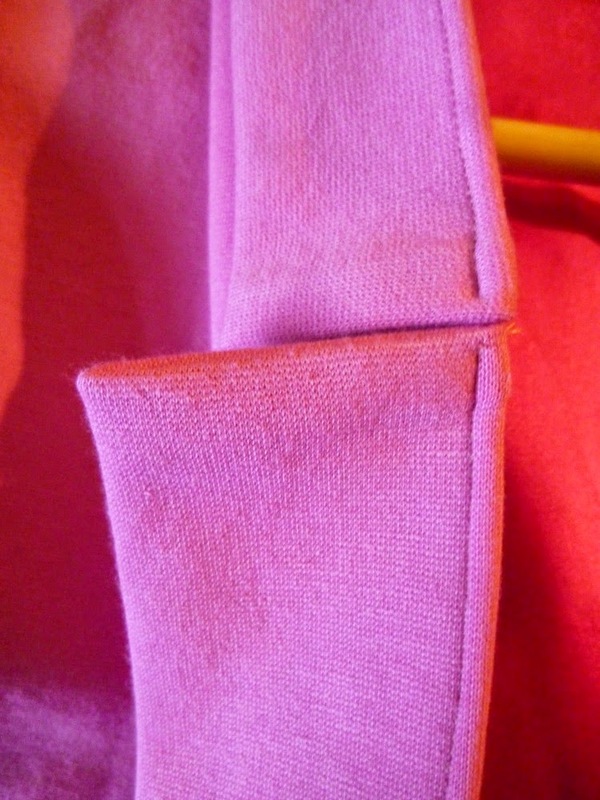 Baste cuffs together before sewing to sleeve. 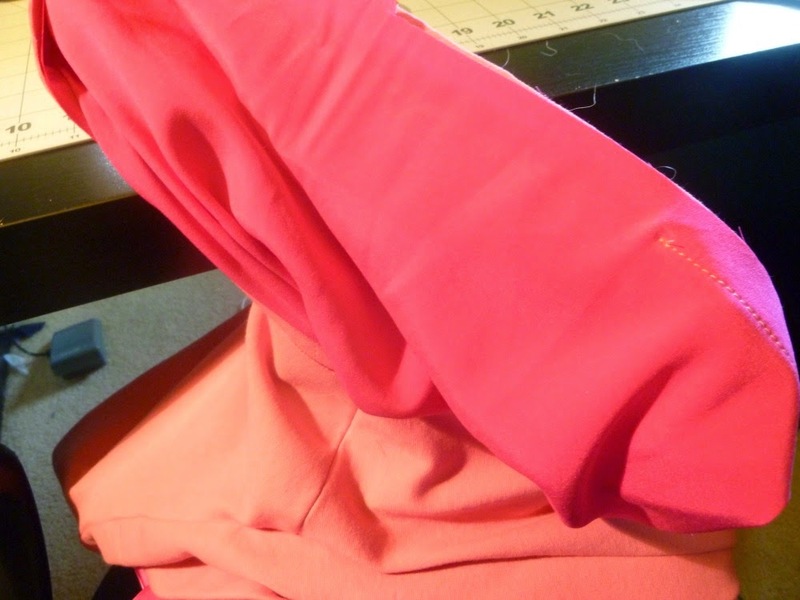 The cuffs are sewn to the sleeve using French seams. The instructions and sewalong are great, but I found while sewing my first cuff that I had a hard time keeping everything in place. Above, you can see that on the right-hand cuff, the ends don't exactly stay together. 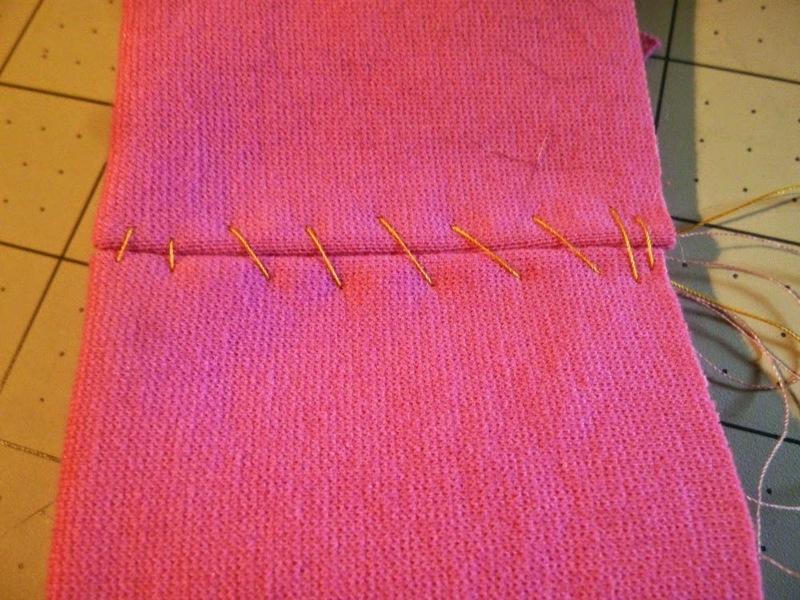 They're supposed to be butted up against each other, but while sewing they moved around. For my second cuff, I basted the ends together using silk thread. Silk thread is amazing for hand-basting, now that I've tried it I won't go back! It's smooth and pulls out easily. 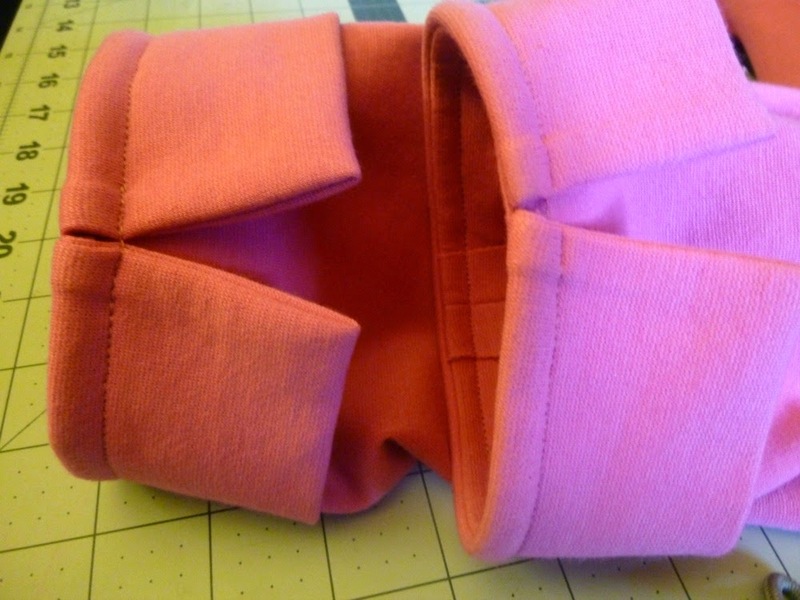 With the cuff ends basted together, I was able to keep everything in place while sewing the French seams (the left-hand cuff in the photo above). Looks much better, right? Everyone hates slipstitching linings, right? 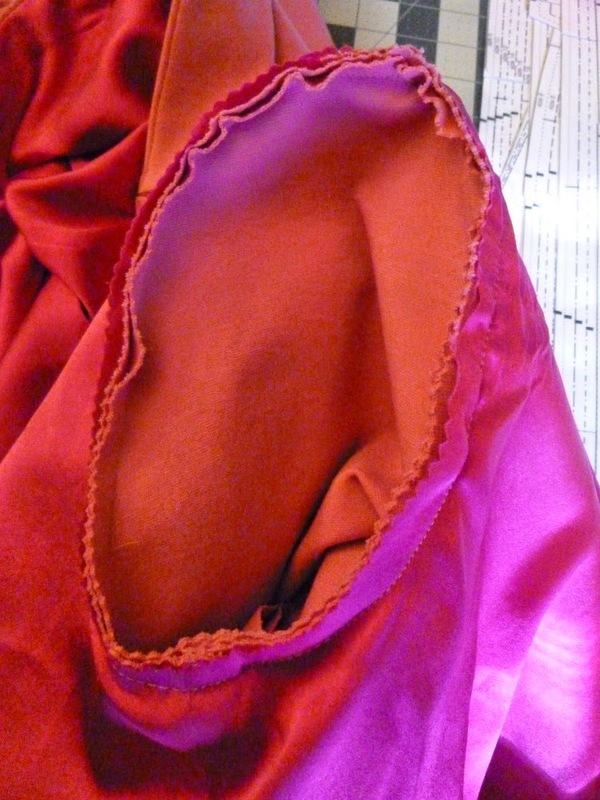 In order to avoid that, I set my sleeves into my jacket dead last (more on that below). The benefit to that was that I was able to bag the lining, leaving an opening at the center back, turn, and then pull the seam allowances out through my armscythe (which had no sleeve attached). 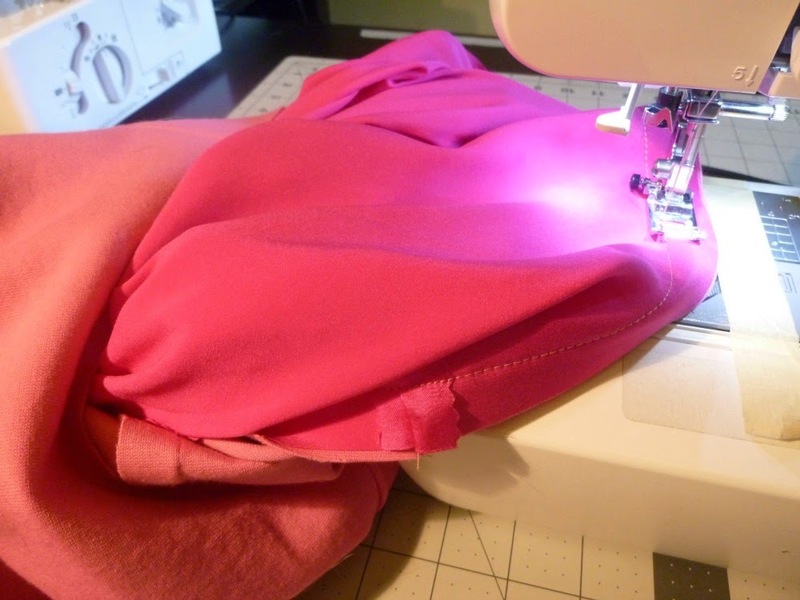 It was a nice big opening which gave me plenty of room to maneuver and finish bagging the lining with no hand-sewing. Clear as mud? How about some photos! WS lining, stitching ends at white dots, leaving an opening. Turn right-side out through opening, press. Reach into armscythe and pull out the unsewn portion. Unsewn portion/opening, which has been pulled out of armscythe. Sew unsewn portion along previously pressed line. Stuff everything back in through armscythe. Press. I had another, more brilliant (if I do say so myself) reason for working out a different order and setting the sleeves last. Sally at The Quirky Peach had mentioned in her review that the lining had a tendency to slip down. 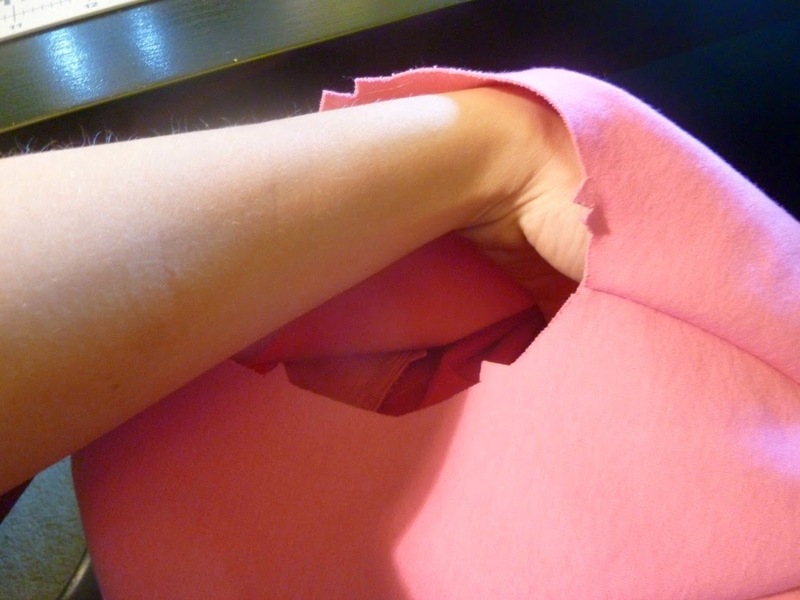 She recommended tacking the lining to the seam allowance of the sleeve to keep it up. I thought to myself, why not baste the armscythe of the lining to the armscythe of the shell, and then set the sleeve in to both at the same time? Frankly, I don't know why the instructions don't have you do it this way. I might be missing something obvious, but it worked amazingly for me. 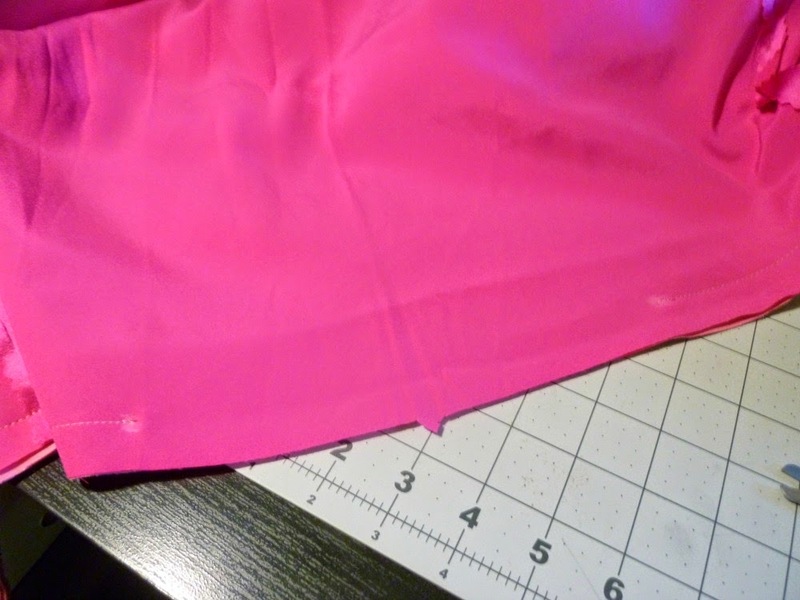 I pinked my seam allowances but you could easily serge this whole area and finish it neatly. I mentioned this in my initial review, but my lapels were flopping all over the place. My ponte was fairly thick and the seam allowances were causing some rolling. I'm not sure if it will happen with every fabric, but if your lapels are driving you nuts, consider topstitching them down. 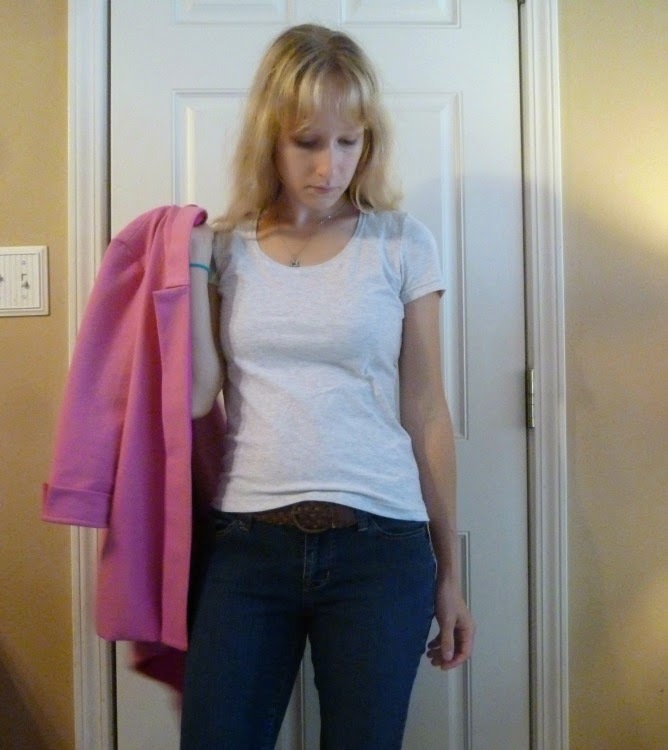 I also saw one blogger who topstitched UNDER the lapels and collars, which helped her. In case I didn't say it enough before, I LOVE the way this blazer turned out. The colors make me happy, the silk makes me happy, it's great! I highly recommend this pattern if you're looking for a beginner blazer project. Questions about these methods? Hollar at me in the comments! Ha, I wish this post had existed before I tackled my ponte Victoria! The bit about basting the cuffs together in particular would have saved me some amount of headache. I also wondered what fabric to line a ponte jacket in, thanks for the info on stretch charmeuse. I ended up not lining mine at all, which led to a whole different set of issues... Thanks for all the details and your blazer looks great! Looks like your version turned out pretty well anyway! I love the whole look. I'll remember that whole bias tape thing if I make another and don't want to line it.